Celebration Foundation SPF 50 is a hydrating, full-coverage powder foundation. Now with SPF 50 broad spectrum protection, you can treat and protect skin while airbrushing your skin for the appearance of complexion perfection. Bye Bye Under Eye concealer is your full-coverage, anti-aging concealer. Infused with hydrolyzed collagen, anti-oxidants and vitamins A, C, and E, this concealer provides full coverage to visually camouflage the appearance of imperfections. The IT’s Your Beauty palette includes skin-perfecting products. Vitality Matte Bronzer gives the look of warmth to your skin with a talc-free hydrating powder. Hello Light Creme provides the look of light and lift. Bye Bye Pores Pressed Blush helps blur the look of imperfections across your cheeks while adding a beautiful flush of naturally pretty color. And Bye Bye Pores Pressed Powder will give your skin the look of airbrushed perfection and treat your skin to anti-aging ingredients. The Heavenly Luxe foundation/concealer brush custom-cut to make easy application of each product. What I think: It Cosmetics always creates the perfect products to make your skin look flawless. The concealer is my favorite ever, it works on dark under eye circles and can be used as a foundation, a little goes a long way! The Celebration Foundation makes it quick and easy to apply foundation and it gives great coverage. The brush will work for all of the products in the set. And, if you haven’t tried IT’s brushes, they are super soft and luxe. Now, my favorite product is the palette. 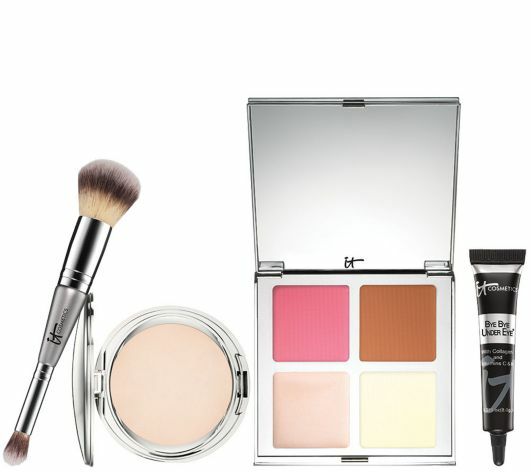 It has everything that you need to finish your look in one compact — powder, blush, bronzer and highlighter. I am going camping next week and I will not be without some makeup! This palette will be perfect to have on hand — it’s so pretty and easy to use. Available now at http://www.qvc.com or tune in to QVC today. The Item Number is A265298. This fantastic deal will be over tonight at Midnight EST! Are you going to pick one up? Leave a comment and let me know!